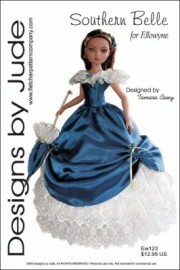 Up for consideration is Southern Belle for Ellowyne dolls. The pattern features a multi-layer petticoat, floor length gown with shoulder flounce and directions to make a matching umbrella. This pattern is also available for Antoinette/Cami. The pattern was designed by Tamara Casey. The PDF version prints on A4 and 8 1/2 x 14 legal size paper. 2 ¾” gathered lace, small wooden dowel, cone filigree, large bead, elastic.